To their pleasant surprise, the landing party was greeted warmly. After exchanging a few words of broken Portuguese, the natives clearly understood that the strangers’ condition was dire. They were quickly escorted to a cluster of huts in the form of beehives on the upper banks of a clear stream. After entering one of the shelters, they were treated to a warm meal with some kind of delicious grain. The strangers ate and drank as they had not since leaving the Netherlands. As they grew sated, they began to observe their surroundings more clearly. The people who had met them with such great hospitality were healthy and smiling. Their color was as dark as soot, they noticed, but their teeth were white and strong, and their lively eyes were full of intelligence. Most strange was their language. The clicking sounds they made were baffling to the foreigners; they could only compare it to the clucking of hens or the gabbling of turkeys. Only van Riebeeck had had the chance to study the reports of previous travelers and shipwrecked sailors on the coast of southern Africa. As he became more acquainted with his generous hosts, he realized these were not the Hottentots others had encountered, who looked rather like Spaniards and were not known to tend any crops. No: these must be the black Africans that Vasco da Gama had first encountered around a thousand miles northeast of the Cape in 1488. Da Gama had found these people so friendly and hospitable that he named them the Boa Gente — the Good People. As it became clear that the Dutch meant to settle permanently on the Cape, some difficult questions arose. One day in late December 1652, van Riebeeck was invited to a ceremony on Table Mountain. As he and a few followers climbed up the steep slope, van Riebeeck was reminded just how lucky they were. Before them stretched a fertile plain, rimmed by sparkling blue ocean. Fresh water poured down the slopes to grassy banked streams and lakes where hippopotami rolled. The fields of herbs and flowers gave a rich fragrance to the air. He would occasionally stop to catch his breath and ask — in his broken Xhosa, with a few words of Portuguese mixed in for good measure — what a specific plant was called and what it was used for. The answer came circuitously: “The firstcomers told my great-grandfather, who told my grandfather, who told my father, who told me, that this plant can be ground up with a little bit of water, and its paste used to heal cuts.” Van Riebeeck had written many times in his diary about this peculiarity of speech. Those natives he had talked to were always careful to distinguish themselves from the “firstcomers,” who had not settled permanently or cultivated crops and who spoke an unintelligible tongue. After the council had assembled, van Riebeeck took the floor to explain the purpose of the settlement and how he saw the future relationship between Europeans and the natives. He explained that he was under strict instructions from the highest levels of the VOC not to establish a colony. The objective was simple: “to supply the crew of the Company’s passing trading ships with fresh water, vegetables and fruit, meat and medical assistance.” In exchange for help in rendering these services, the Europeans were prepared to offer almost any goods they could import from Holland or Batavia. Some of the natives expressed concerns that this was a false front: they wanted assurances that promises wouldn’t be broken, that they wouldn’t wake up one day in the near future to find a horde of Europeans running amok over the land. In response, van Riebeeck reminded them that they had only survived that first harsh winter because of the help of the Boa Gente. There simply weren’t enough people to tend to plants and animals in sufficient numbers to feed the Europeans and the passing ships — not to mention that they still knew little about the strange new land. In short, the Dutch were at the mercy of the Boa Gente. By 1713, the Cape had become the rest stop of choice for all East Indiamen. From Antwerp to Cochi, Malacca to Macau, sailors’ eyes glistened at the mention of the Cape. Fantastic stories were told of the taverns, alehouses, and brothels the Cape held. Among the town’s many pleasures, one must surely not discount the sorely needed laundry service. It was through this unlikeliest of avenues, though, that the germ was planted for the peace and prosperity of the Cape to crumble. On Tuesday 13 February 1713, forty-seven-year-old Johannes van Steeland disembarked from the Amstel, a caravel from Amsterdam. He was heartbroken: on the journey, his wife and four children had died from smallpox. Moved by his plight, the Bantu chief invited him for dinner to his residence and offered to do his laundry. By May 1713 a pandemic raged. There was not even enough wood in the Cape to bury the dead in coffins. Soon, though, it was realized that the disease discriminated. Around a quarter of the Europeans died — but among the Boa Gente, only 1 in 10 people was left alive. The cornucopia of herbs and remedies the Cape had to offer — which had been so highly prized by all the settlers — proved ineffectual. With less than a quarter of the men it once had, the Cape became host to a ghost town. Agriculture and animal husbandry collapsed, seemingly overnight. Worse yet, the struggle over the scant remaining resources erupted into anarchy. Neighbors turned against each other. Some of the chiefs, meeting at Table Mountatin, reminded the Cape dwellers that it was a tradition of hospitality that had ensured their prosperity, and it would be that same hospitality that would see them through these hard times. After all, did the old proverb not tell of the hosts who, saying “We have no food at all,” caused the traveler to go hungry through the night? That August, more snow fell on the Cape than in living memory — even more than had fallen in that first harsh winter of 1652. Difficulty compounded difficulty as the inhabitants of the Cape struggled to find enough food to feed themselves and their children, let alone to supply passing ships. 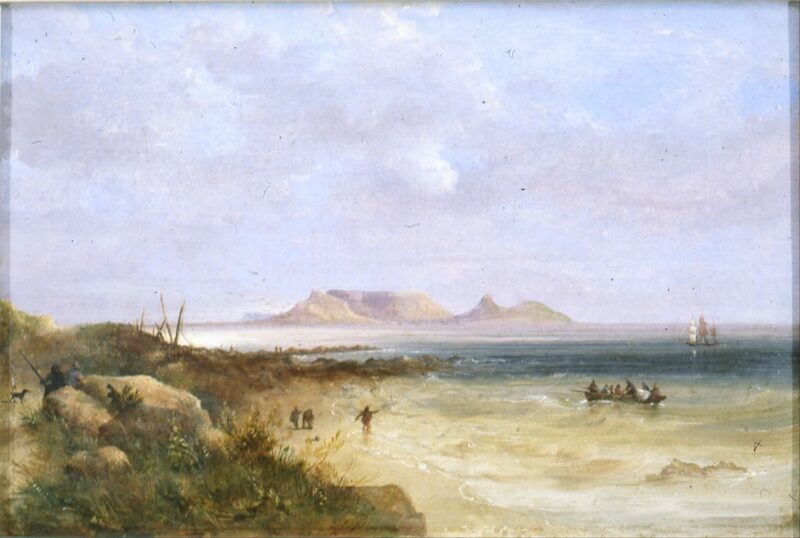 The sailors who had so lusted after Cape Town on the journey from Batavia found themselves sorely disappointed. It was one of these seamen who struck the final blow to the Cape community. He spread the word that it was moral laxity that had caused this pandemic. After all, there were thousands of liasons between Boa Gente and Dutch, not to mention the many other ethnicities that had immigrated in the preceding seventy years. One day, the Christian inhabitants gathered together in solemn assembly and proclaimed that those who survived the plague were predestined to heavenly redemption. Reaffirming their membership in the Dutch Reformed Church, they declared the superiority of their race and affirmed that their only salvation from the pox was to enforce a firm separation of the Cape’s peoples.